In this tutorial series we’ve talked about using a variety of tools to move your camera, with special attention paid to fast-paced documentary shoots. There's a lot of neat gear out there, both new and time-tested, to help you achieve creative camera motion. Simply getting into a car can introduce many new kinds of shots to help add variety in your documentary edit. But you don’t have to use any special piece of equipment or even a car to get your camera in motion. There are countless ways to put yourself on a moving platform—you just have to look for them. Here are a few ideas to get you thinking about creative ways to add camera motion on your documentary shoot. Many of these I’ve personally done on shoots, but I’m certain there are many other ways to move yourself. Get creative! If you can comfortably hold your camera while safely riding a bike, you can shoot in a huge variety of locations where cars would be impractical. This is especially the case with attaching a GoPro or other action cams (or your smartphone), which allows you to steer and pedal without holding onto the camera. The best part about shooting from a bike is you can capture long distances and speed them up later in your edit. Whether you use time-lapse photography or a long video capture is up to you. If you want to use your regular DSLR or cinema camera, which you have to hold while biking, it's better to shoot for very short, slow scenes where you aren’t in the way of pedestrians or other bike or car traffic. If you still own a pair of rollerblades, in some ways they’re even easier than shooting from a bike. You can control your speed and braking with just your feet. In order to get a good shot, you’ll want to speed up first and then shoot while you’re coasting in a straight line. If you know how to skateboard, you can capture even better footage than shooting from roller blades or a bike. Namely, a skateboard allows you to move straight forward, while you can point your camera ahead of you, behind you, or to the side. Of course if you’re Casey Neistat, you can skateboard while pointing a camera towards yourself, while vlogging, and drinking a smoothie, and waving at people. For the rest of us, simply sitting on a skateboard and have someone push you can give you all the thrill you can handle, while still coming away with decent footage. There are also those electronic self-balancing scooters that were all the rage until they became fire hazards. I actually got one and tried shooting from it, and to be honest they’re not really viable unless you become really good at riding on them. For one, it’s difficult to maintain a steady speed, since a slight shift of your feet can speed up or slow down the scooter. And you also have to face directly forward, or else the scooter will want to turn with you. Plus, the whole fire hazard thing. There are commercial camera operators who have made use of them, as well as their big brothers, the Segway, but I think they’re impractical for documentary filmmakers. An old standby for low budget, independent filmmakers, the shopping cart or wheelchair is still a decent tool for adding motion to your shot. It’s especially nice for solo shooters, since you can set your tripod in any kind of cart or utility wagon, and push it along while watching your shot. On a wheelchair, it’s more ideal to have someone push you while you’re filming, but you can still shoot solo by either placing your camera directly onto the wheelchair, or using a tripod or any other available object to raise the camera to eye level. The main issue with using carts on a documentary shoot is that you have to bring one along, and that can defeat the whole purpose of using available moving objects as camera platforms. The other consideration is if your surface is at all rough, a cart may be so bumpy that it might make smooth shooting impossible. On the other hand, if you’re shooting inside an office, or warehouse, or a large home, you can usually find large areas with smooth surfaces, such as carpet or concrete. And often those places will have a roller chair around, which may be the simplest camera motion tool of all. Outside of cars, there are lots of ways people get around for recreation, such as ATVs and snowmobiles, boats and jet skis. This is an easy way to not only capture great moving action, but also gives you an opportunity to use recreational vehicles as part of your story. So if you know in advance that your subject owns and operates one of these, maybe there’s a component to your documentary that can involve boating or snowmobiling out to a location. For recreational vehicles, you can certainly shoot from the backseat behind your driver, and I’ve done it a few times, but your shots are fairly limited. If you can get pulled on a wagon, however, then you can sit back and shoot a variety of angles and frames. A boat, on the other hand, allows you a ton of flexibility in terms of shot variety. In fact, you can shoot an entire documentary from inside a boat, from interviews to B-roll cutaways to landscapes. 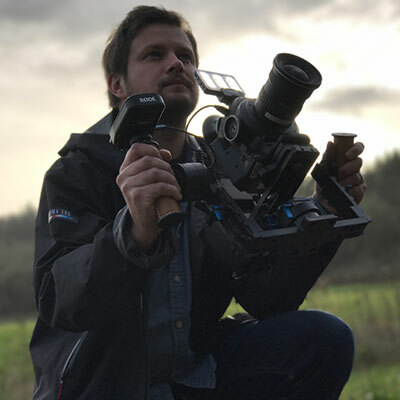 The above methods of moving your camera are only the tip of the iceberg, and I mention them specifically because they are used often on documentary shoots. But you can add even more creative motion to your video by thinking outside the box. Try jumping onto a city trolley, light rail, or a regional train for a longer excursion. Escalators, glass elevators, and moving walkways can be found all over. At a ski resort, if you’re brave, you can shoot from your chair lift, and if you’re braver, while skiing or snowboarding downhill. In a major city, there might be a horse-drawn carriage tour that you can take for a short trip. City busses and subways are of course ubiquitous, but there are often rules against shooting video on heavily trafficked public transit, so make sure to check ahead. Above all, remember to prioritize safety over getting a really good shot. It’s really easy to get lost in the moment, with your camera pressed against your face, and forget about your surroundings. With that reminder, you have virtually unlimited ways to add motion to your documentary video, so go out there and get moving!